Would you like to work with beginning shooters or shooters who want to do competitive rifle or pistol shooting? Would you like to be a coach/instructor for your club or SFNS? If so we would like you to become a recognized NCCP coach/instructor. Club coach - NCCP Instructor-Beginner in Training. Provincial coach - NCCP Competition-Development Trained. 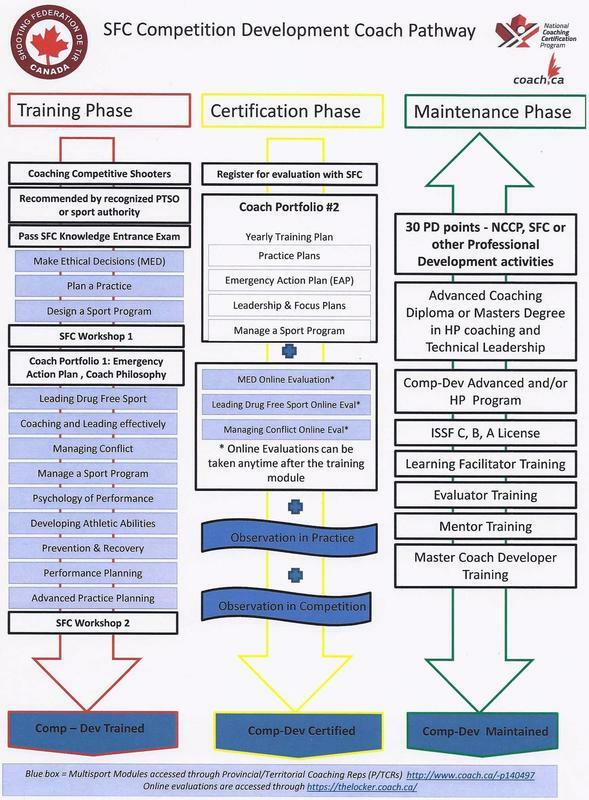 The SFC currently participates in the Instruction and Competition streams of the NCCP and currently offer Instructor-Beginner (I/B) and Competition-Development (Comp-Dev) courses while Competition-High Performance (Comp-HP) will be coming soon. The theory portion of the courses is given by the province. Go to www.coachingns.ca to find out when and where these courses are held. Check back often or contact us if you are interested in taking any of these courses. Each of these are two day course. Cost of the course will depend on the number of students and location plus the cost of the manuals. If you are interested in these courses or upgrading your current coaching level contact us at info@sfnscoaching.com to be put on the list. You will be notified of the date, time and location. SFNS coaches must adhere to the requirements of the Canadian Policy Against Doping in Sport and the Canadian Anti-Doping Program. The Canadian Centre for Ethics in Sport (CCES) is responsible for administering the Canadian Anti-Doping Program. More information on this is available on the sport Canada website.